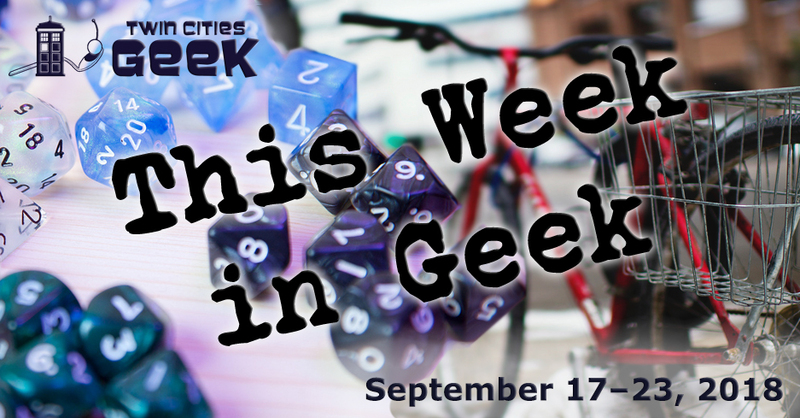 Welcome to This Week in Geek, your guide to events of interest to the Minnesota geek community for the week of Monday, September 17th to Sunday, September 23rd. When: Monday, September 17th at 6:30 p.m. When: Tuesday, September 18th at 5:00 p.m. The MN Publishing Tweet Up returns for their September event! Come on down to Urban Growler to share space and network with other writers, readers, and publishing folks. You’ll find friendly and like-minded book geeks, and might learn some really interesting stuff about the publishing world. Minnesota-based tech nonprofit Glitch hosts Gaymer Space, a monthly gathering giving the LGBTQ+ community a place to gather, game, and geek out over shared interests like video games, board games, and the tech industry. This free event lasts from 5:00 to 8:00 p.m. and will provide a casual space to hang out that should be fun for all ages. When: Tuesday, September 18th at 5:30 p.m. This youth-centered event is intended to let young minds explore the greater cosmos and learn about stars, planets, and galaxies. This class will teach how to collect astronomy data, use telescopes to discover the night sky, and explore the moon and constellations. The class is open to grades three through six, and costs $50. Café Scientifique—presented by the Bell Museum of Natural History—is “a happy hour exchange of ideas about science, environment, and popular culture, featuring experts from a variety of fields on diverse and often provocative topics.” This month’s topic is “Fishing in Food Desert,” and will be led by Urban Organics, an organization which transformed five stories of dilapidated concrete into a thriving fish and vegetable farm. Tickets are $5 to $12, online or at the door. When: Tuesday, September 18th at 7:30 p.m., Wednesday, September 19th at 7:30 p.m., Thursday, September 20th at 7:30 p.m., Friday, September 21st at 7:30 p.m., Saturday, September 22nd at 7:30 p.m., and Sunday, September 23rd at 7:00 p.m.
Minnesota playwright Barbara Field penned this captivating retelling of Mary Shelley’s classic of science fiction to celebrate its 200th anniversary this year. This retelling focuses on the ethical limits of science and the human imagination as Dr. Frankenstein prepares to confront his creation in the Arctic Circle. Tickets during this preview run start at $15. If you’re looking to plan more Frankenstein-related events, check out our article here. When: Tuesday, September 18th at 7:30 p.m.
Come and experience YogaQuest, a blend of yoga and fanfiction storytelling led by certified yoga instructors. Experience a yoga workout experience and a story at the same time. The theme for this week is The OC, so get yourself in a California mood. This event costs $15. When: Wednesday, September 19th at 6:00 p.m. When: Wednesday, September 19th at 7:00 p.m. The local cult-cinema screening series Trash Film Debauchery returns to the Trylon in time for a screening of Double Down, an action thriller about a brilliant hacker, a terrorist attack on Las Vegas, and obsessions with love and death. Double Down is the first in a screening series based on the works of Neil Breen, a successful real-estate agent and producer of bizarre cinema. If you’re a fan of Tommy Wiseau, but find that The Room is too normal for your tastes, check out Neil Breen’s bizarre works (which are rapidly joining cult-movie canon). Tickets are $5. When: Wednesday, September 19th at 8:00 p.m. The Parkway has returned! Come check out the new space with a screening of Spike Lee’s Do the Right Thing, and see an early work from the seminal filmmaker. The Parkway will be showing a rare 35-millimeter print of Do The Right Thing just in time for Spike Lee’s return to the popular imagination due to the success of his new film, BlacKkKlansman. Do The Right Thing focuses on one day in Bedford-Stuyvesant, Brooklyn in 1989; a day of heat and racial tension. Tickets are $10. When: Thursday, September 20th at 6:00 p.m.
Minneapolis Institute of Art continues the free Third Thursday series with a focus on musical flow. There will be live music from local wordsmith Dwynell Roland, DJ sets from Go953MN, opportunities to write art-inspired flow, create a collage, and more. This event is also an opportunity to see the artist Beth Dow discuss her show “Prediction Error,” in the Minnesota Artist Exhibition. When: Thursday, September 20th at 7:00 p.m. When: Thursday, September 20th at 7:30 p.m. When: Friday, September 21st at 6:00 p.m.
Mischief Toy Store in St. Paul invites you to experience some Magic with them this Friday night for this Magic: The Gathering draft event. Entry is $15, and all players will receive prizes, including a “fancy promo card.” This weekly event is limited to 24 players and typically lasts until about 9:00 p.m. All skill levels are welcome. When: Friday, September 21st at 7:00 p.m.
Smithsonian Magazine’s Museum Day is Saturday, September 22nd, and they will be providing free tickets to a wide variety of local museums. Whether you want to geek out about local history, culture, or technology, this day will have you covered. Some local favorites that will be participating include the Mill City Museum, the Bakken, Hennepin History Museum, Scott County Historical Society, Center for Hmong Studies, and more. Check out the website to find the museum for you! When: Saturday, September 22nd and Sunday, September 23rd from 9:00 a.m to 7:00 p.m. The Minnesota Renaissance Festival is celebrating its 48th season, and will be open weekends from August 19th to October 1st! Come experience a wide variety of Renaissance-themed activities, including musical acts, comedy shows, artisan markets, food and drink, actors in costume, games, demos, jousting, and kid-themed events. The fest is open rain or shine, and tickets are $24.95 for adults, $22.95 for seniors, and $15.95 for children at the gate, and there are other ticket and pass options available on the fair website. This weekend’s theme is “Pet Fest,” so look out for doggos in costume (perhaps even a serene Doge), races, and more. When: Saturday, September 22nd at 10:00 a.m. Spend a beautiful fall day in nature at the annual Fall Raptor Release event put on by the University of Minnesota’s Raptor Center. This event will go on rain or shine, and will be a great opportunity to meet the Raptor Center’s winged ambassadors, take part in children’s activities and educational booths, and watch recently rehabilitated birds of prey get released into the wild, with the formal releases occurring at 11:00 a.m. and 1:30 p.m. This is a free event, and the Raptor Center requests that attendees do not come with pets. When: Saturday, September 22nd at 10:00 a.m. to Sunday, September 23rd at 6:00 p.m.
Geek culture and counterculture combine for the third-annual LionCon in St. Cloud! LionCon features role-playing games, board games, card games, video games, computer games, anime viewings, and more. Expect artists, panels, gaming, a cosplay contest, an afterparty, and other attractions. Special guests include W.F. Bell, Lewis “Linkara” Lovhaug, Brian Berg, Jaime Coker, and others (check out the site for a full guest list). Admission is $40 at the door. When: Saturday, September 22nd at 11:00 a.m.
Come experience traditional Japanese culture at the Normandale Japanese Garden Festival, which is returning for its fifth year. This event features a wide variety of events focused on educating and engaging the public with Japanese culture, including music, dance, art, movies, talks, martial arts, and family-themed activities. Check the website for a complete listing of activities, as there’s likely something for everyone. The suggested donation for entry is $10. When: Saturday, September 22nd at 7:00 p.m.
Northwest metro sci-fi and fantasy geeks: Come on down to the Buffalo Community Center for a casual meetup. The event typically starts off with an informal discussion of games, films, books, TV, and graphic novels before voting on what to watch. This is a very low-key event and is steered by the interests of attendees. Per the group’s website, the loose topic for August is “Urban Fantasy,” so get in the mood for works like The Dresden Files and more! When: Sunday, September 23rd at 10:00 a.m. When: Sunday, September 23rd at 12:00 p.m. When: Sunday, September 23rd at 12:30 p.m. Gender Jam—a meetup group for trans, gender-nonconforming, questioning, and intersex youth—will be meeting up for an afternoon of community and fun. This week, Gender Jam will be hanging out at the Exchange and playing video games, from the old school to new VR stuff. As always, bring your permission slip if you are under 18. When: Sunday, September 23rd at 4:30 p.m.
Come together with your fellow science-fiction and comedy geeks for an afternoon of communion and quoting along to Spaceballs, Mel Brooks’ beloved spoof of Star Wars, with bits pulled from Alien and Planet of the Apes for good measure. Enjoy the film with your fellow geeks, and props provided by the Alamo, including “Schwartz Sticks,” combs, and noisemakers. Tickets are $12.99 (that’s dollars—not spacebucks).